This week I have been repeating myself. I try hard not to do it but as I get older I find that it's an undeniable truth. I think I'll start paying the kids to poke me when they catch me doing it in public. But I digress and that's not what I mean anyway. This week I have been making the spokes which involves a huge amount of repetition, none of it is hard or arduous but it's easy for the mind to wander when doing something for the 100th time. A wandering mind and a large hammer is not necessarily a good combination I find. 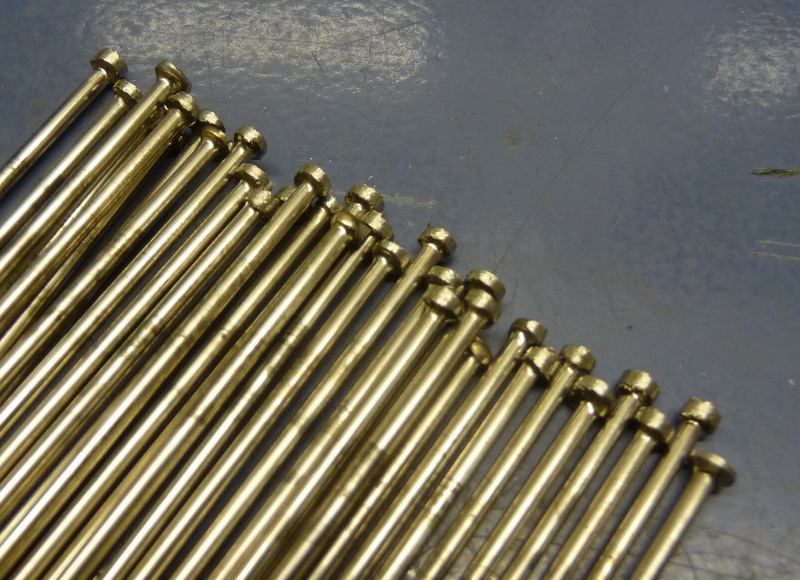 The 13 gauge spokes are made from 2.4mm (0.094") wire. 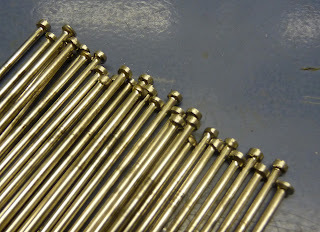 The threads are rolled on which raises the crest of the thread and increases the final diameter to 0.099" (#3 x 56 UNF). The donor wire I have used is 308 stainless steel TIG welding rods. 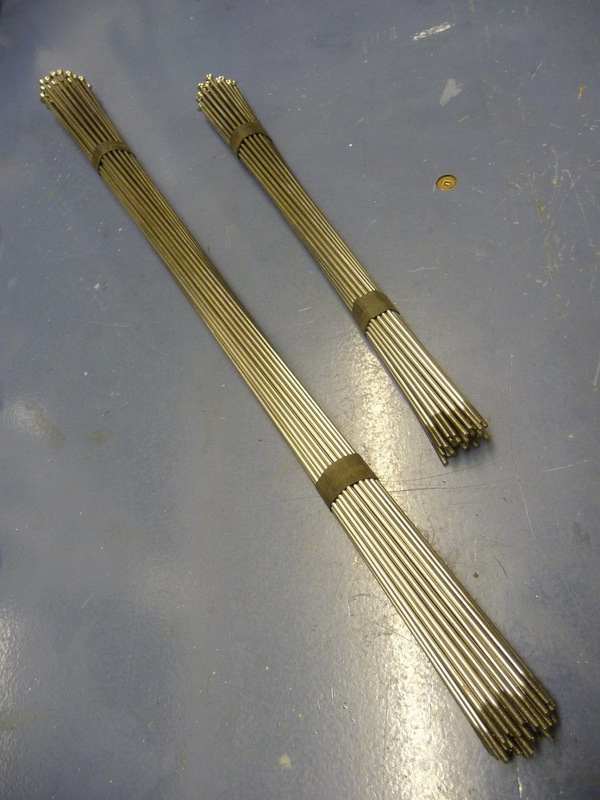 I'm somewhat reluctant to use stainless as it isn't an original material in use in the 1880's, However in my defence, I have scoured NZ for high tensile wire in the correct size and failed miserably. It is very easy to get 2.5mm wire but this is too large for the thread roller and the threads produced are then too big. That 0.1mm does make a big difference! If I do find a source in the future, I may revisit this. 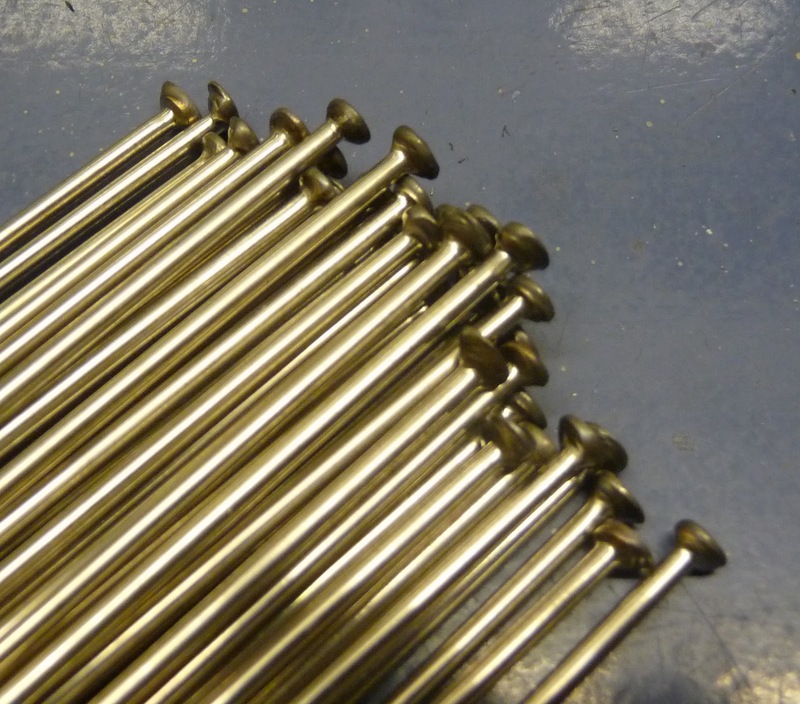 for reference, most modern stainless spokes are made from 304 stainless. The first step is to put a head onto all the blank pieces of wire. I haven't done this for a few years and it took a bit of practise to get good at producing a decent shaped mushroom. 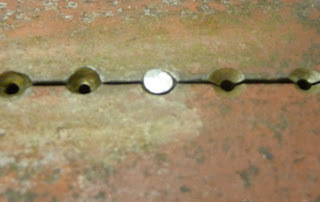 The wire is clamped between the two halves of a die with a few mm extending. This is struck with the hammer to form a head into a slight countersink in the top surface of the die. Now having previous experience of this I was able to make a suitable die to overcome some of the issues. The first one is that the wire has to gripped very tightly. I made my die from a length of angle iron I found in my magic cupboard. By clamping a sheet of paper between the two sides of the die before drilling the hole at size, the final hole will be a very tight fit when the paper is removed. The hole should be as long as you can drill it to increase the friction of the clamp. 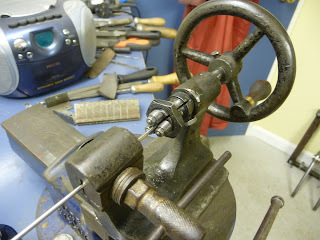 The second problem is that as you are hammering away, the die will get deformed. 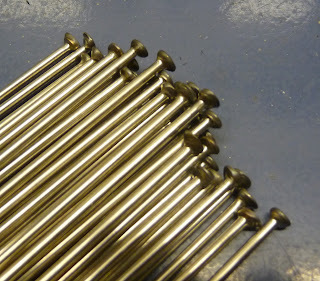 I've found I can get about 20 spokes headed in a mild steel die before it needs cleaning up. 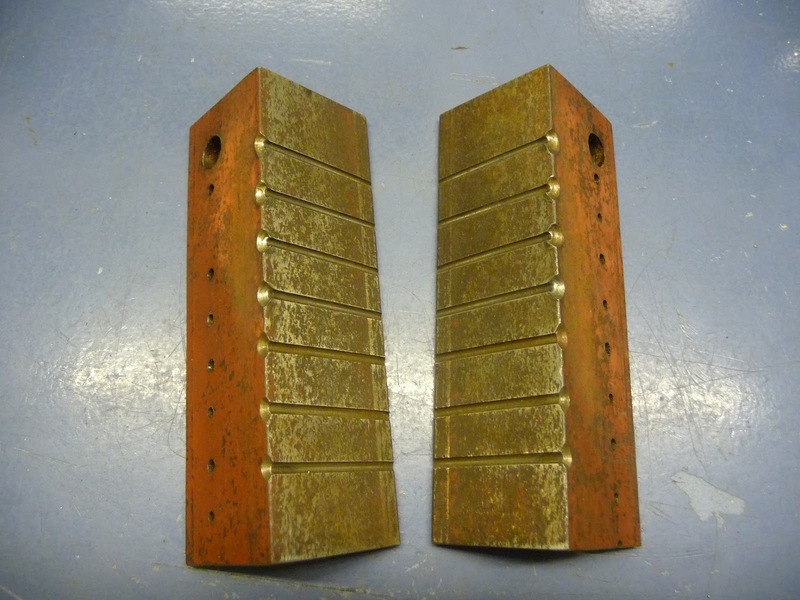 It is possible to make a die from tool steel and get it hardened to prevent this deformation, these do last considerably longer but can also shatter. when one gets too munted, start to use the next one along. ...which is then clouted with a big hammer. I found I was unable to cold head the stainless steel, I needed to heat up the wire extending out of the die with a torch before hitting it with the hammer. This is not ideal as the resulting heads will be weaker. Time will tell. The raw spoke heads out of the first die. The heads at this point are all over the place, functional but very irregular and just a bit crap. Mr Middleton would have been fine with them but my OCD (according to my lovely wife) made me improve them. 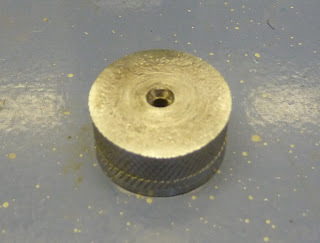 I made another die from some tougher 4140 steel, this die is not split but has a slightly larger hole and a countersink (actually both sides were used since it still got munted from the hammering). I was able to make the heads round (rounder anyway). 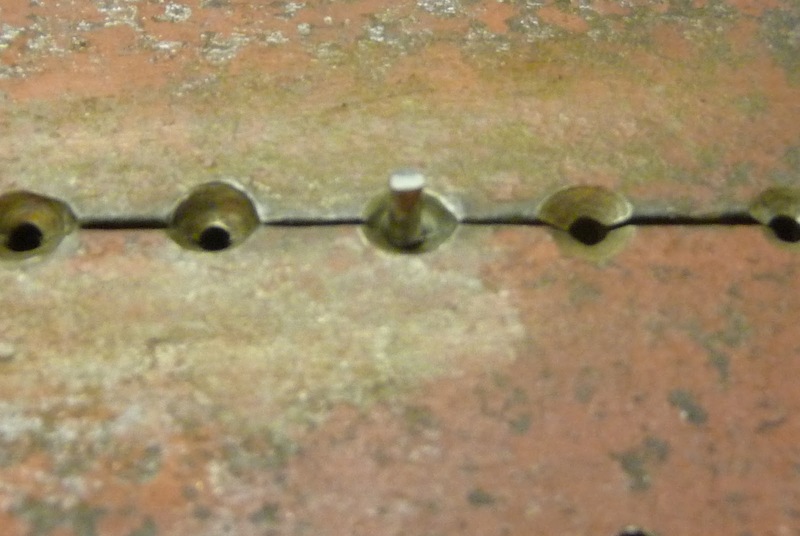 into the countersink, producing a far more even, consistent head. Next step is to calculate the length of the spokes using a bit of trig. I did this twice on separate evenings to check that I'd got it right before I did any cutting. 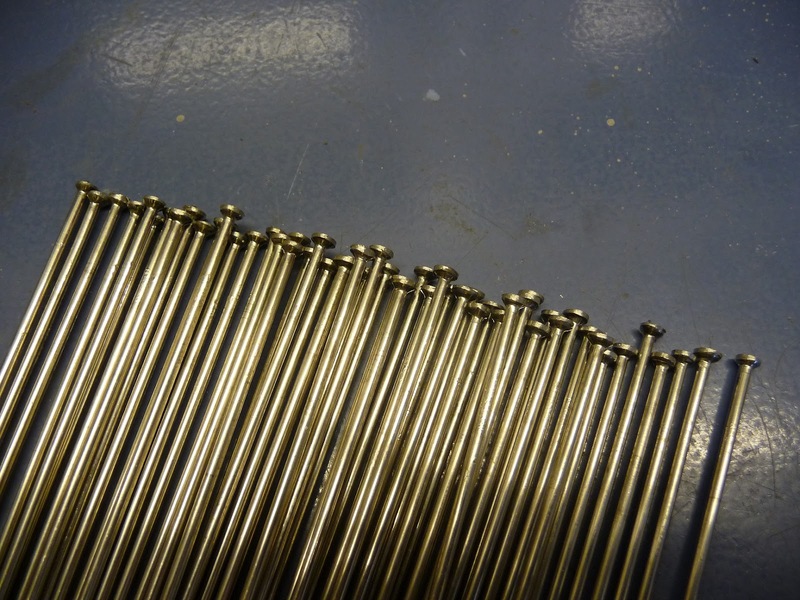 Finally roll the 13 Gauge threads onto the other end and we're all done. I didn't think I had a 13G thread roller but my magic cupboard produced the goods once again. The rims have finally been painted, but with the colder weather, the paint is not drying as well as I'd like. I'm itching to build the wheels up but I need to be patient. In other news, my lovely wife is to have some fairly major surgery next week. Obviously, I am incapable of looking after her and the children unassisted so my Mother-in-Law is coming for a month to help out. We are all very excited about this as you can imagine. I have been given a very long list of "stuff which must be done". 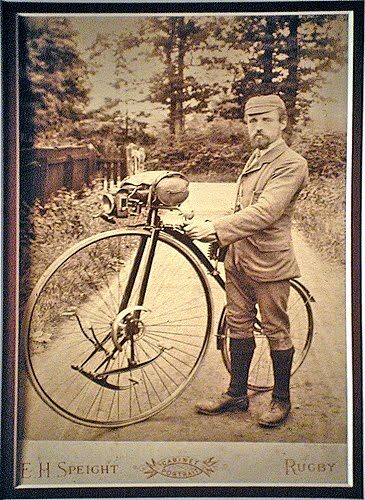 I suspect that if I haven't got the wheels built by then the paint will be fully cured by the time I do get around to it. We will see. Le race is on Saturday. I realised last night that drinking beer and watching the TV does not constitute "training". I'll do 20km tomorrow night after work, that'll do.